This girl takes her studies seriously. Maybe she's the pre-med girl down the hall who keeps you in check around midterms, but you also love grabbing a bite to eat or watching a movie with her. Show your thanks by getting her chic study gear: chevron striped notebooks, a Marc by Marc Jacobs laptop case, or a pair of super comfortable J.Crew flats. Your study abroad BFF went through the entire crazy experience with you. And you would love to travel with her again -- afterall, you went through it once and had a blast. 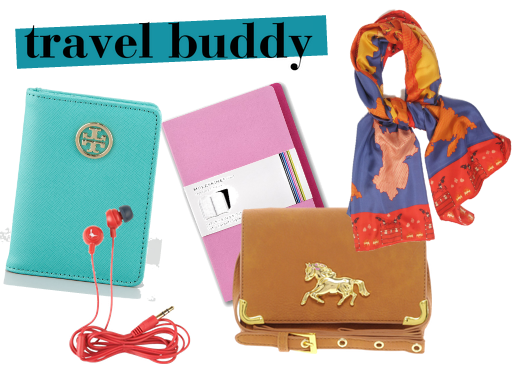 For the worldly traveler, get her a stylish passport case, bright earphones for plane and train trips, a Moleskine travel journal, a classy yet easy to take bag (Asos) on the go, or a chic scarf that reminds you of another part of the world. Your girl's night outs are almost always with this girl, who ushers all the cute guys in your direction (and you do the same for her!) For the girl that works hard and plays hard, set her up with a pair of glittery heels, the coveted Naked 2 palette, a chic studded clutch, your favorite lip gloss, and some shot glasses. Whether your not your roommate is your true BFF, you've grown close just by sharing a bathroom and space. Get your roommate some stylish household gifts to spice up her space (and yours): Kate Spade gem coasters (or these! 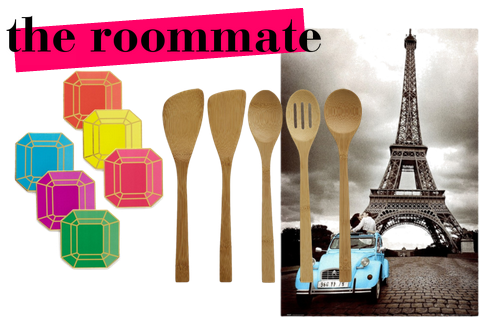 ), bamboo cooking utensils, and a Paris poster. What are you getting your BFFs?